Our classic noodle soup with diced white chicken meat, is perfect for any time of the year and is sure to satisfy. 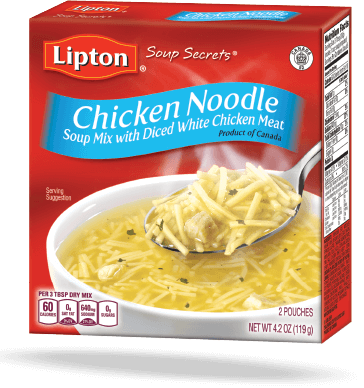 Chicken Noodle - Soup Mix with Real Chicken Broth is rated 4.4 out of 5 by 64. Rated 4 out of 5 by beautyvantage from I received this and the Extra Noodle version free from Influenster to try and review, and while I prefer the Extra Noodle variety over this one, because I love noodles and am not a big fan of the rehydrated white chicken meat chunks, this was still a far superior soup to canned soup. I usually use them as a base I doctor up with spices and sauted veggies anyway, but I also followed the Chicken Taco recipe suggestion (plus some hot sauce and lime juice) on the box once and thoroughly enjoyed it. If youre looking for an easy lunch especially, these taste good and can be prepared super quickly! Rated 4 out of 5 by ryaz1 from A good soup mix, but not great. 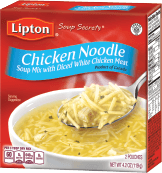 Its something that I would buy again after receiving a free box from I Influenster, but probably not in the near figure.The flavor was good, as was the amount of soup that it made, but there was something about the size of the noodles that made me like this soup less than I otherwise would have. There needed to be more, and they needed to be thicker.Overall I would say this product is worth buying as long as you arent in it for the noodles themself. Rated 5 out of 5 by Sandy from Amazing soup The first time I tried this soup I fell in love with it! It tastes so yummy! I now buy the extra noodle one because of how much I love it. I do wish that there was a extra noodle WITH the chicken chunks in it! That would be so awesome if they made one like that. Also a heads up to lactose intolerant people, if this soup upsets your stomach, the box says "May contain milk" on it. I took a lactaid pill with my bowl of soup & it stopped all my stomach issues whenever I eat this soup. Rated 5 out of 5 by jakie from fabulous!! amazing!!!!!!!!!!!!!!!!!!!!!!!!!!!!!!!!!!!!!!!!!!!!!!!!!!!!!!!!!!!!!!!!!!!!! Rated 5 out of 5 by malloryo7bf9 from Oh how I love chicken noodle soup on a cold winter day! This soup is so delicious. The real chicken broth is so tasty! The noodles cook great. This is SO easy, all you have to do is add water, thats it! Its so easy even your husband could do it when hes sick at home! ;) I will definitely buy this again! * I received this product complimentary for testing purposes through Influenster. Rated 3 out of 5 by nansiloo from This soup isn't too bad for a powdered soup. 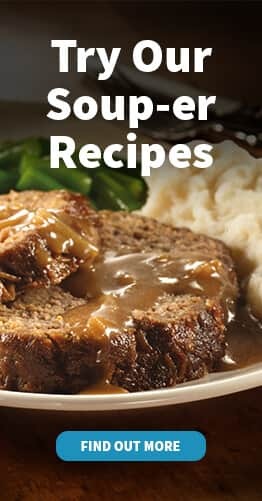 It's definitely an easy meal prepare when there is nothing in the kitchen however it does have a sweet artificial flavor to it that I'm not too fond of. Even when used in a recipe. I would probably purchase this if it were super reduced price just to keep in my pantry but I would stick to making my own chicken noodle soup during meal prep. Rated 5 out of 5 by sharhar8 from I really enjoy this soup. Don't expect anything fancy with it, it's purely noodles and broth, no little chunks of vegetables and chicken or anything. It's also a lot more broth than noodles, but as someone who really likes broth, I like that! It's nice when you're sick or in the winter when you're not necessarily starving but rather want something tasty to warm you up. Rated 3 out of 5 by Anonymous from Got this complimentary in my vox box from influenster. It was surprisingly better than Campbells chicken noodle in the can. It felt less fake. I spiced it up with a poached egg and chilli flakes and it reminded me of a less noodley ramen. Id buy again for a emergency sick day only cause the packets take the least amount of space. Very convenient.